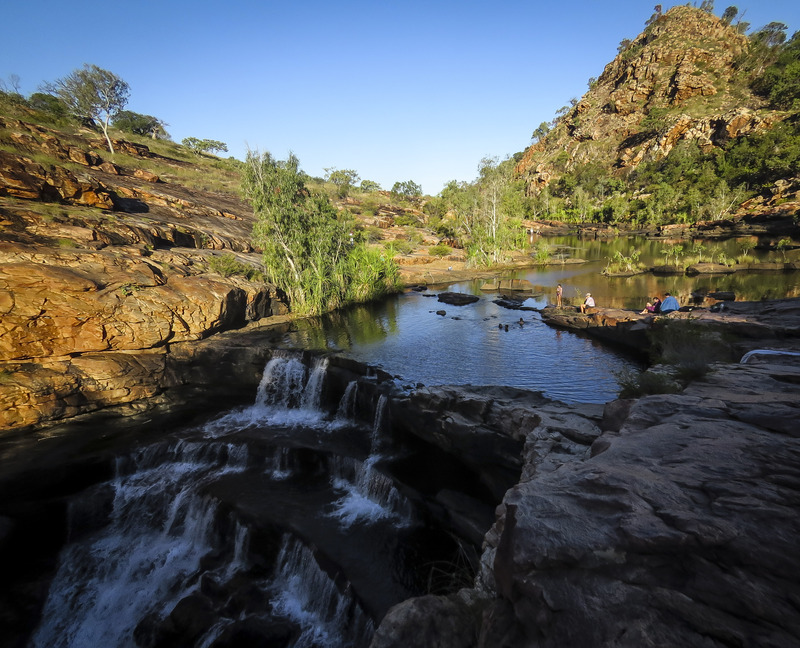 The idea that was to become OZLAP was initially born from our desire to drive the iconic Gibb River Road in the remote Kimberley region, in northern WA. We really wanted to do it, but didn’t want to have to rush and fit it in to our measly 4 weeks of annual leave that we were afforded each year. So based on that train of thought we then decided to hell with it and began to instigate the planning of our unlimited OZLAP and see the whole of Australia while we were at it!!! Fast forward 5 and half years and here we are, early on a Tuesday morning, packing up our caravan and heading out of Broome, bound for Derby and then onto the Gibb River Road (known as the GRR). 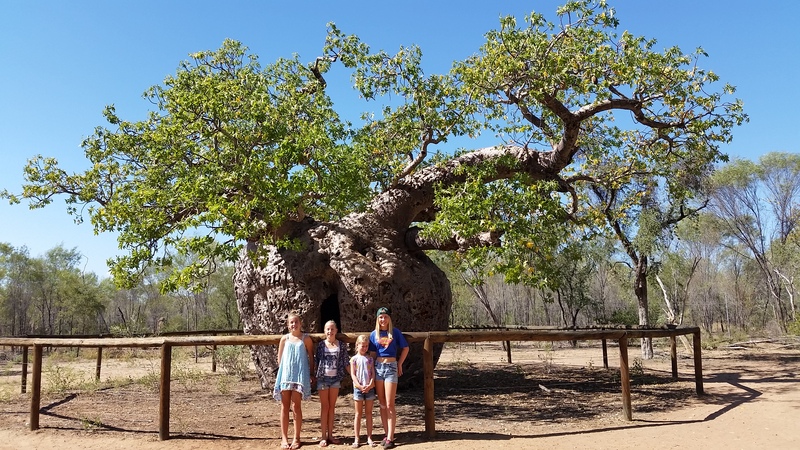 Our stay at Derby was a relatively short and sweet overnighter, we arrived in town early in the afternoon, met up with our GRR buddies, the Leeds, hurriedly set up and headed out to visit the infamous Boab Prison Tree. 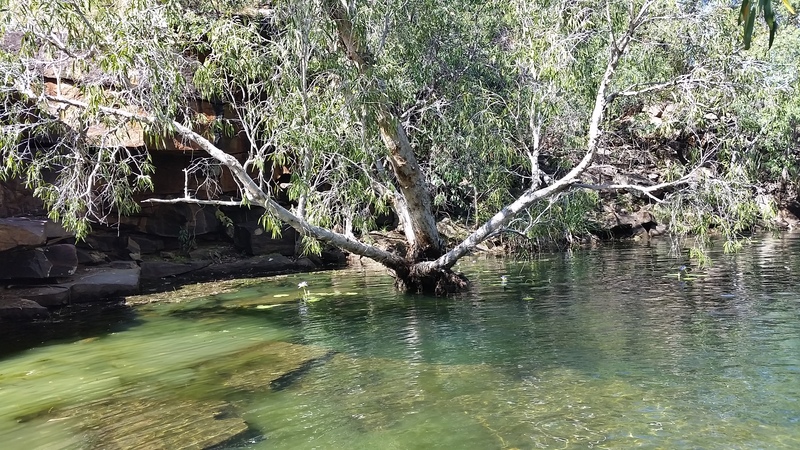 The prison tree was used way back in the uncivil olden days when many Indigenous people from the west Kimberley’s were kidnapped and forced to dive or work on the pearling boats, whilst they were waiting for the boats to come into shore they were held captive in these many boabs. 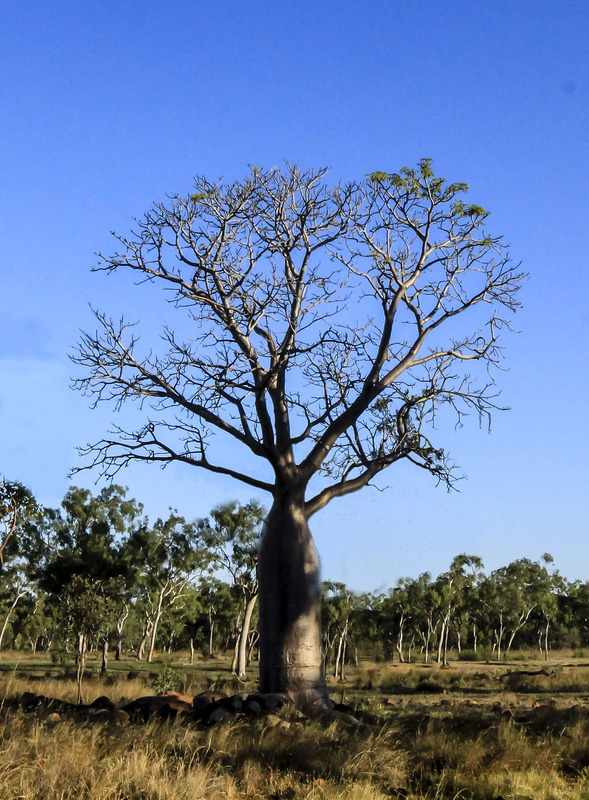 Clearly not a feel good piece of Australian history that we can be proud of, so we instead concentrated on the humungous size of its trunk. We then went to the jetty to see the high tide surging in. 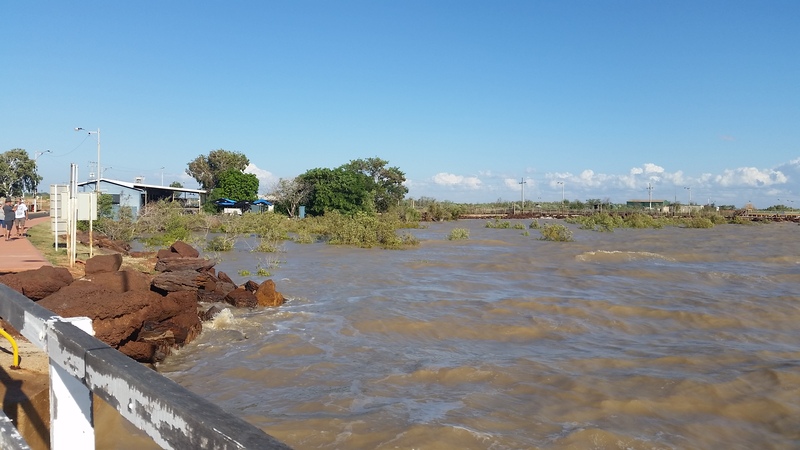 The 9 metre tides in Derby are the second largest in the world, only trumped by Nova Scotia in Canada at 11 metres. It seems Derby likes to do things BIG…. The water rushing in to the shore. But we all agreed there was much bigger things to come and with much excitement we packed up early and set off on the first stage of the GRR, taking the customary photo at the ROADS OPEN sign. 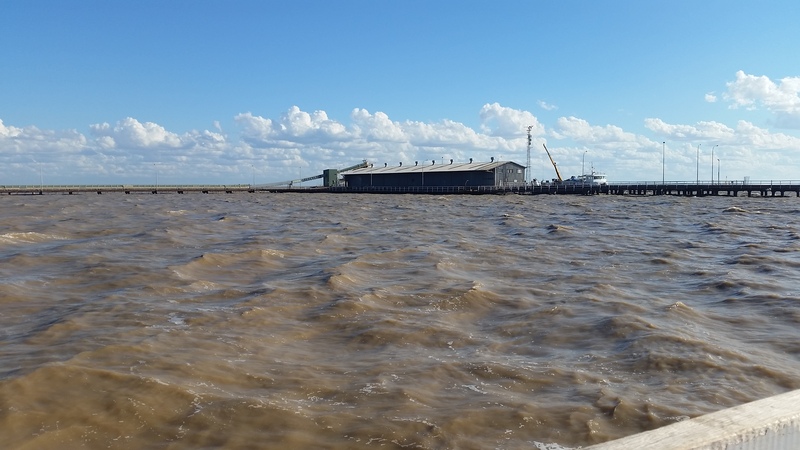 Then much to our amusement and a little disappointment drove for another 100km on bitumen…….. FINALLY, we hit the dirt, it wasn’t too bad, a few corrugations, but nothing that we weren’t expecting. We spent most of the morning driving and stopping to take photos and drone footage of both the Napier Ranges and King Leopold Ranges, arriving at our campground just after lunch. 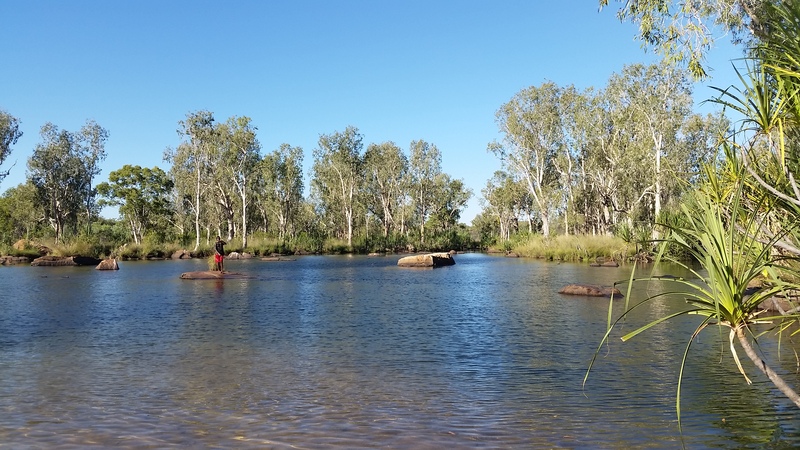 Silent Grove campground is located in 19km off the GRR within the King Leopold Conservation Park, it amazingly has flushing toilets, luke warm showers and drinking water all fed from a spring and only costs $12 per adult. 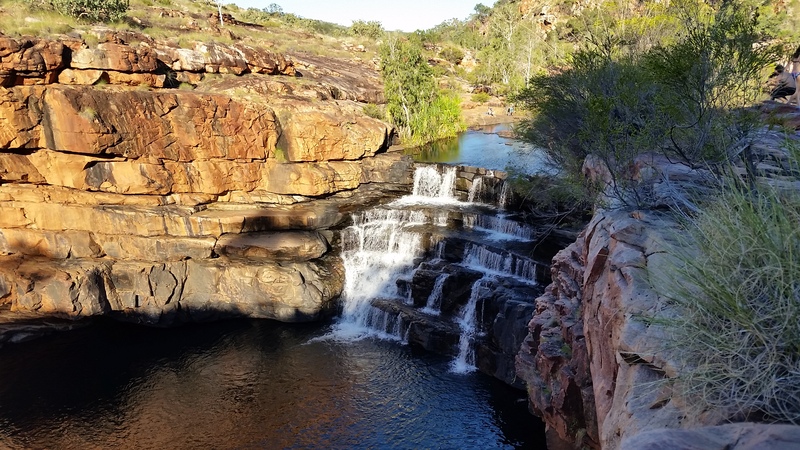 We then spent the next 2 days exploring, hiking and swimming in nearby Bell Gorge. 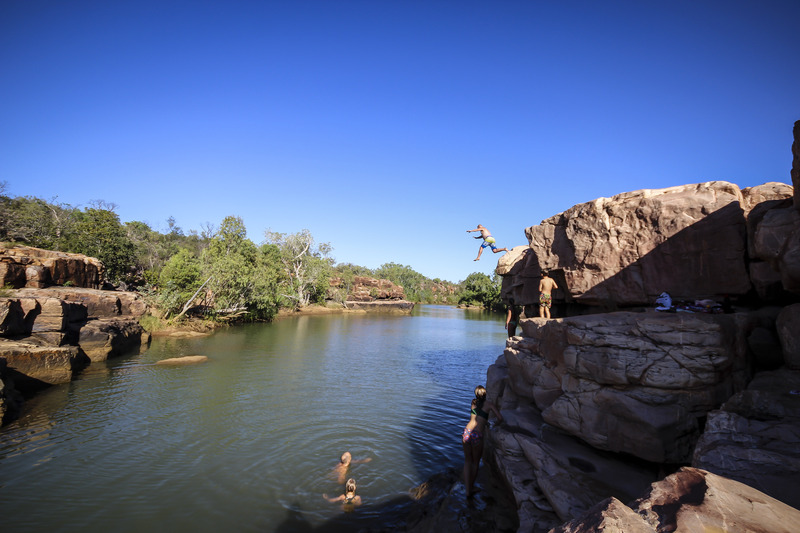 Bell Gorge has the reputation as being the most picturesque gorge in the West Kimberley and much to our delight it didn’t disappoint, with a great short hike into the gorge where we were then able to waste away most of our day swimming, playing and reading. 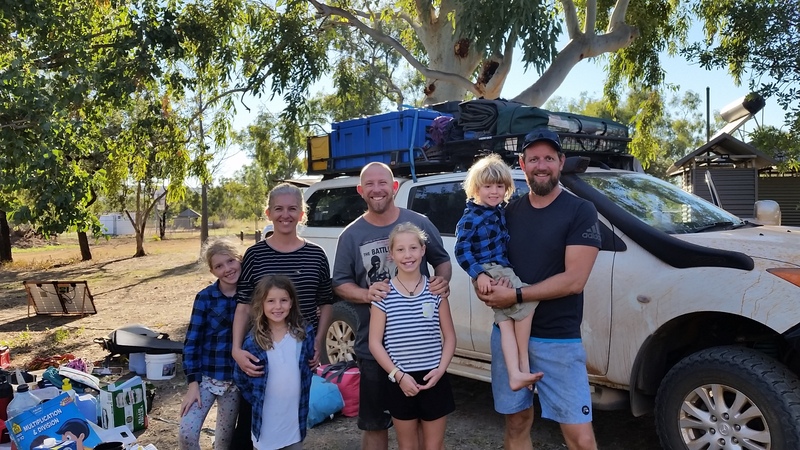 Whilst here we also met another travelling family, the Hamilton’s (www.hamiltonianciruit.wordpress.com), who had been following us on our blog, saw our car and came up and said hello, it was great to meet them and hear about their exciting travelling stories too. The Napier Ranges. ( Thanks to the Leeds for this photo). 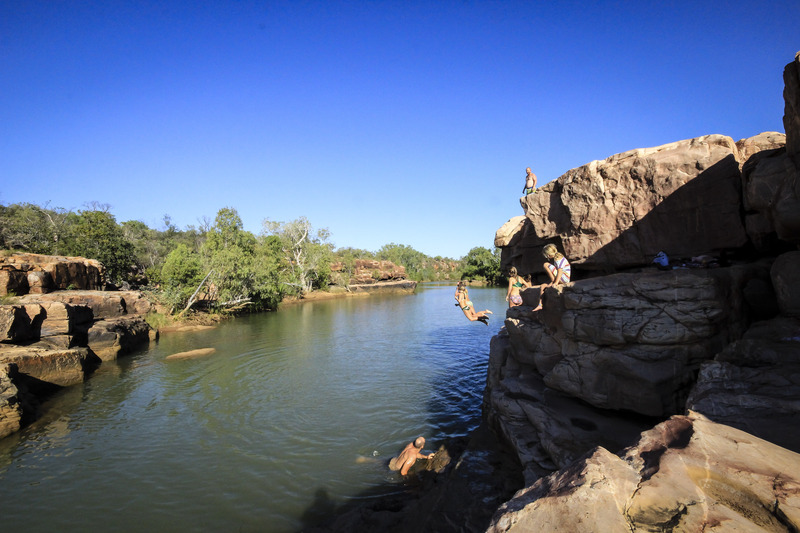 The top of Manning Gorge. 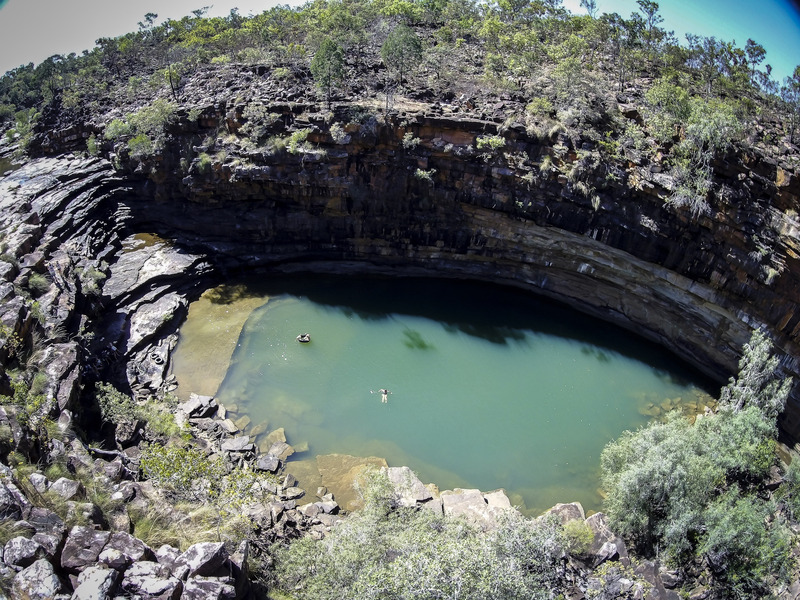 Pools at the top of the gorge. 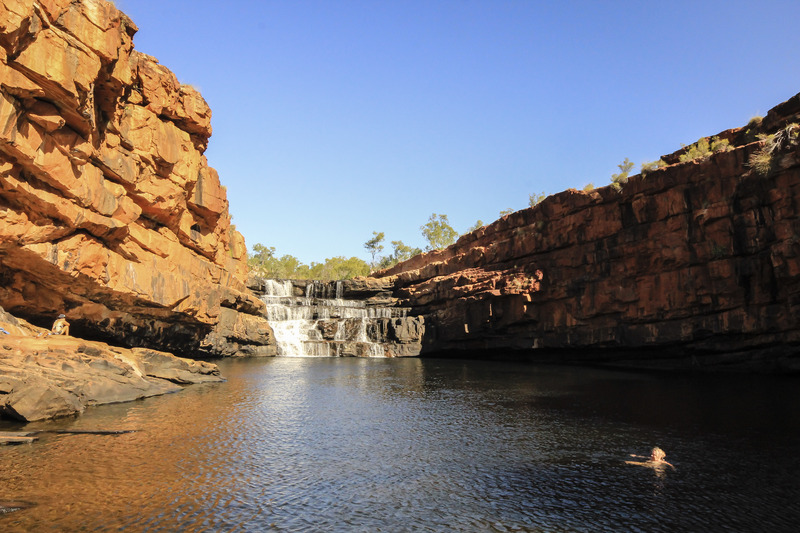 A lazy afternoon spent swimming in Bell Gorge. 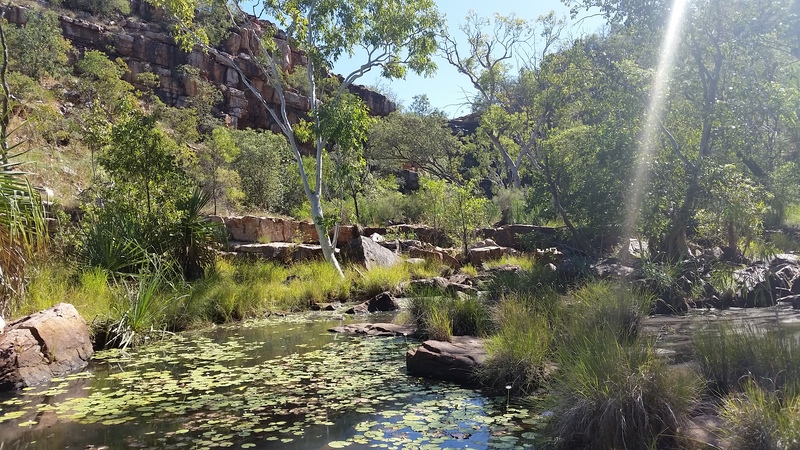 From Bell Gorge we made our way to a place called Charnley River Wilderness Camp, which is located about 43 km west off the GRR. The road in was great as we were following the graders, which we actually nearly ran into when we arrived at the main office, so it was a pretty smooth ride. 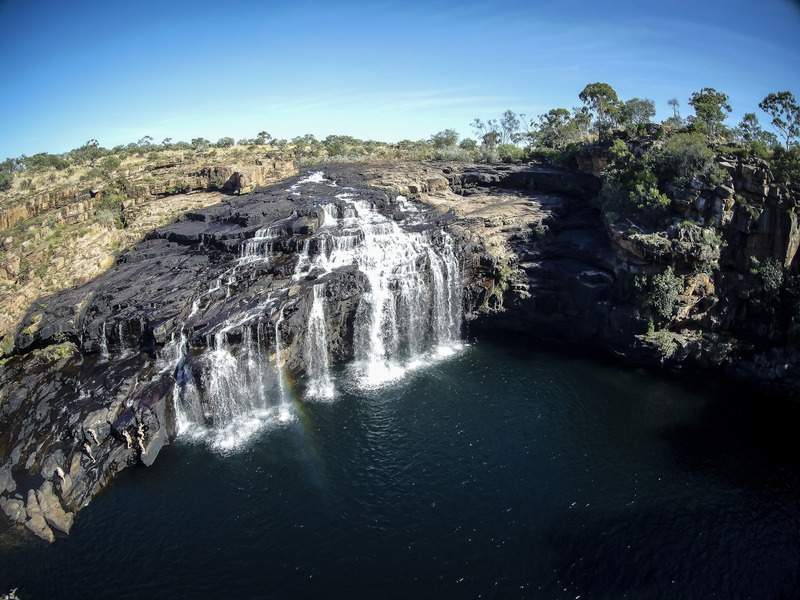 Charnley River Wilderness Camp (previously known as Beverly Springs) has recently been acquired by the Australian Wildlife Conservancy (AWC), a non-profit organisation who pretty much charged us an arm and a leg for a patch of grass, hot showers and flushing toilets. Adults were $20 each and the kids were a ridiculous $10 each, this combined with a vehicle access fee had us paying a whopping $185 for a two-night stay, the lady then added insult to injury and added that we could make a donation online as well……. As far as I was concerned we just bloody well did make a donation!!!! 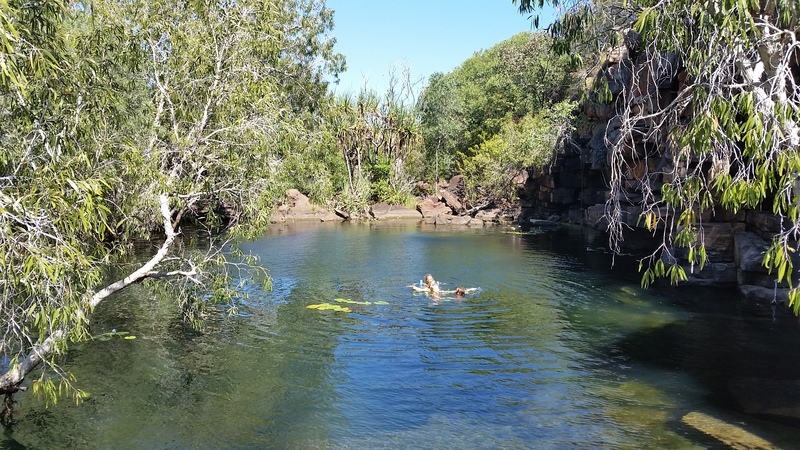 After we set up we decided to take a drive out to Donkey Pools for a swim, where we spent the rest of the afternoon. 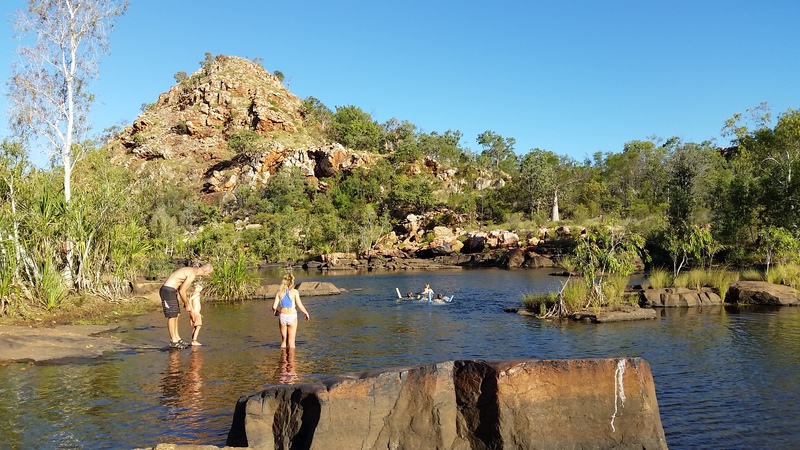 The next day we went exploring the three swimming spots available to explore on the property, Lilly Pool, Grevillea Gorge and Dillies Gorge, the kids enjoyed swimming at each of these and the walks in weren’t overly long too, which is a bonus. On our second night there, the dingos had us feeling a little uneasy with all their howling and carry on, it sounded like there was a whole pack of them and they were surrounding us, right when I needed to go to the loo as well!!! 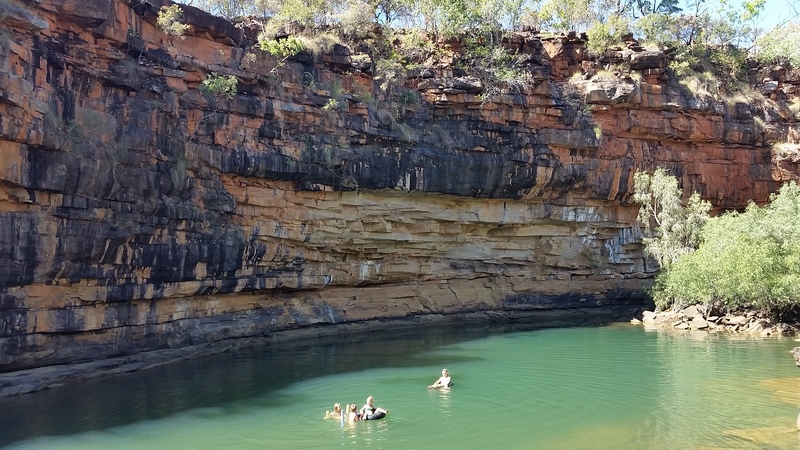 Whilst the gorges were lovely and we got some great photos, our stay was dampened a little by the price, it certainly wasn’t worth the exorbitant cost and we wouldn’t recommend it to anyone purely for that reason. Lilly Pool was very beautiful, but a stagnant. 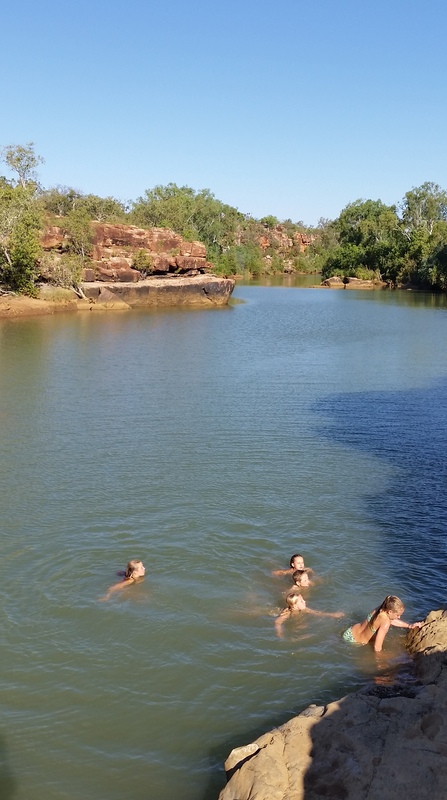 Kids swimming at Dillie Gorge. Nik jumping off the rocks. 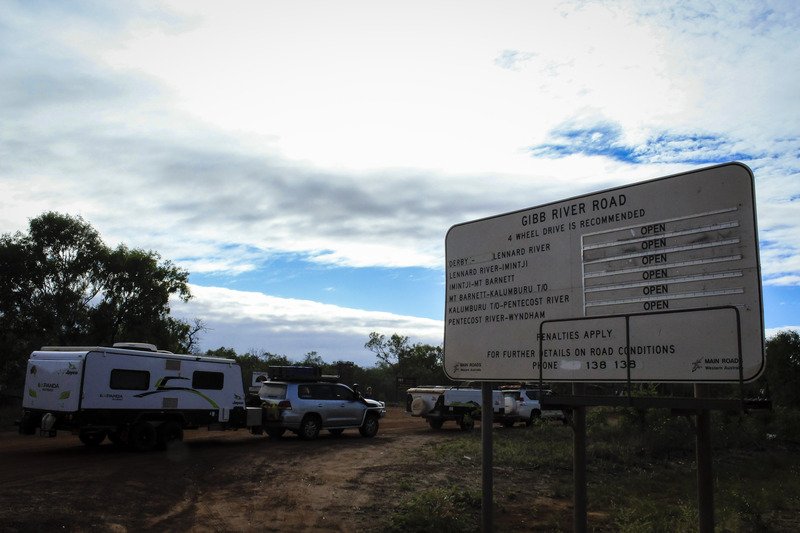 Our drive the next day was only a relatively short one, 43km back to the GRR and then a further 50 odd km’s, we unhooked the van and went for a look at Adcock Gorge, which was no swimming (boo from the kids), then we headed onto our next camp spot at Manning Gorge campground. 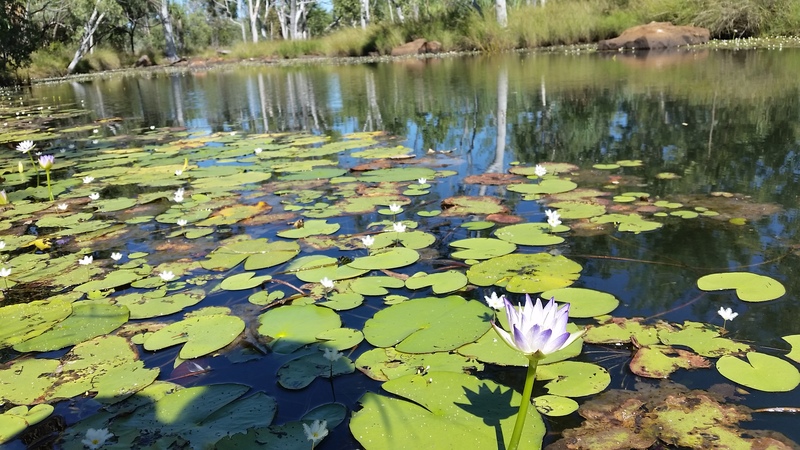 Lilly pads at Adcock Gorge. 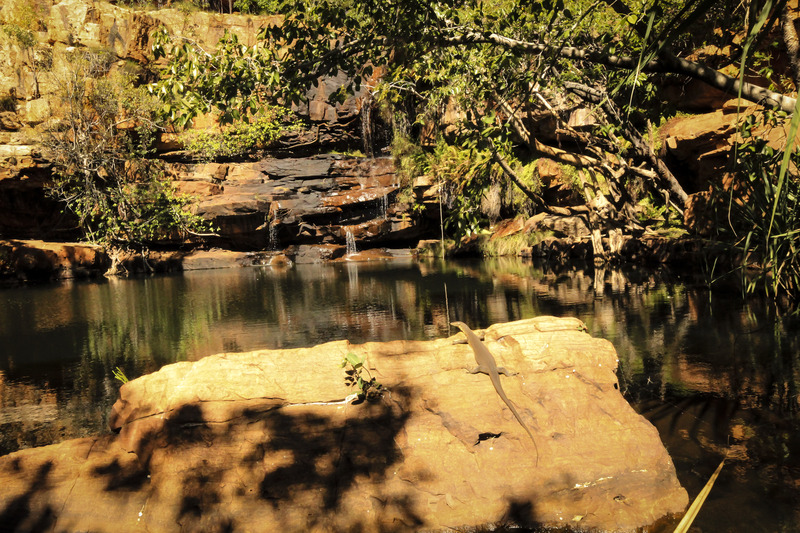 Lizard sunbaking at Galvans Gorge. 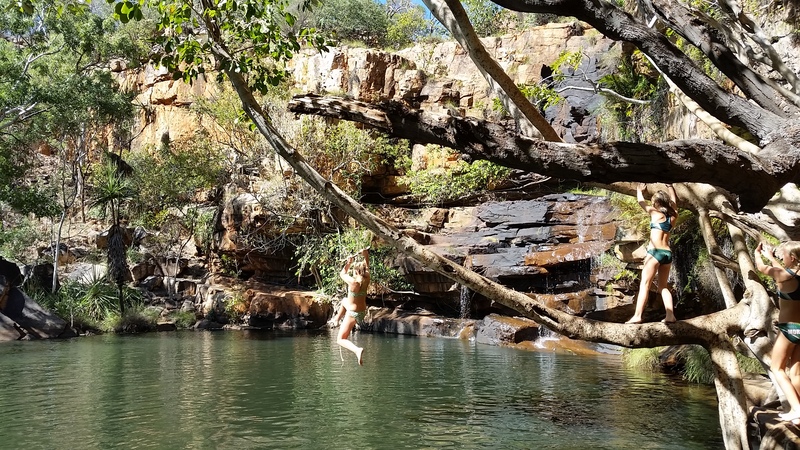 Zoe on the rope swing at Galvans Gorge. 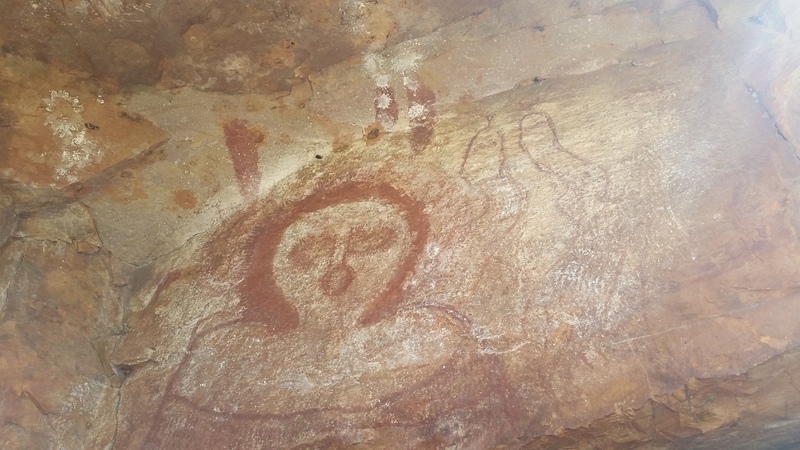 Rock art at Galvans Gorge. 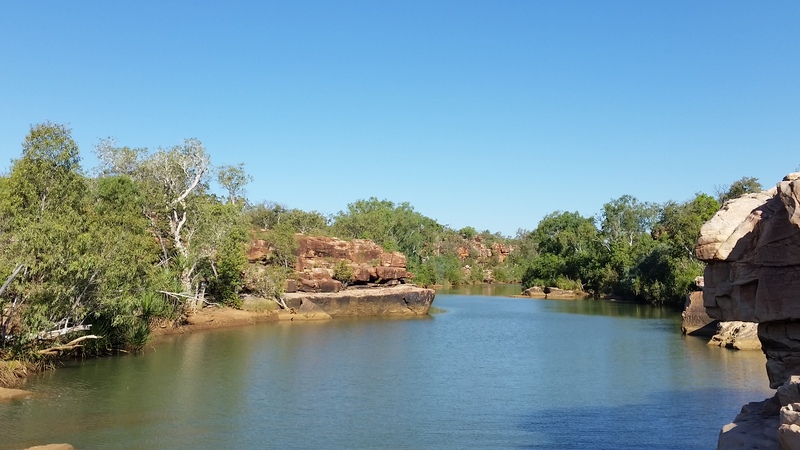 The Manning Gorge campground is situated 7km off the GRR behind the Mt Barnett Roadhouse, approximately located half way along the GRR, and the roadhouse and the gorge campground are both owned and run by the nearby Kupungarri Aboriginal Community. We called in at the roadhouse, bought some bread and milk, paid for our camp spot (a more respectful $99 for 3 nights) and drove the short distance to set up camp. 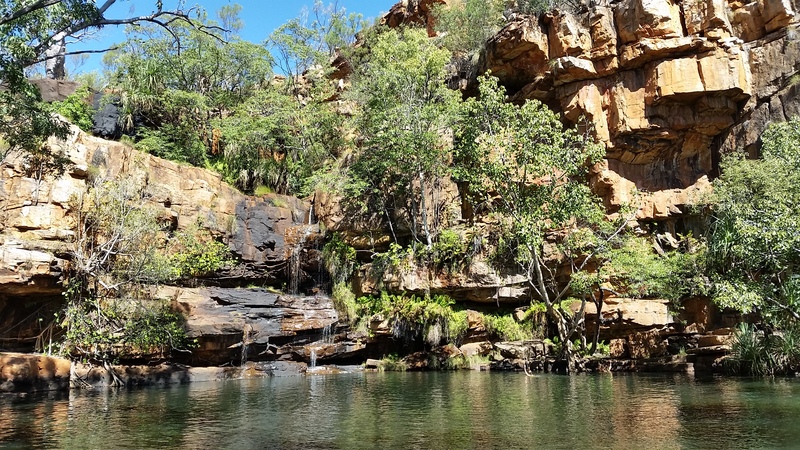 During our stay we hiked the 2.5km walk to Manning Gorge, which started off with a fun little tinny boat and a pulley system to enable us to get to the other side of the river with dry feet, clothes and cameras. 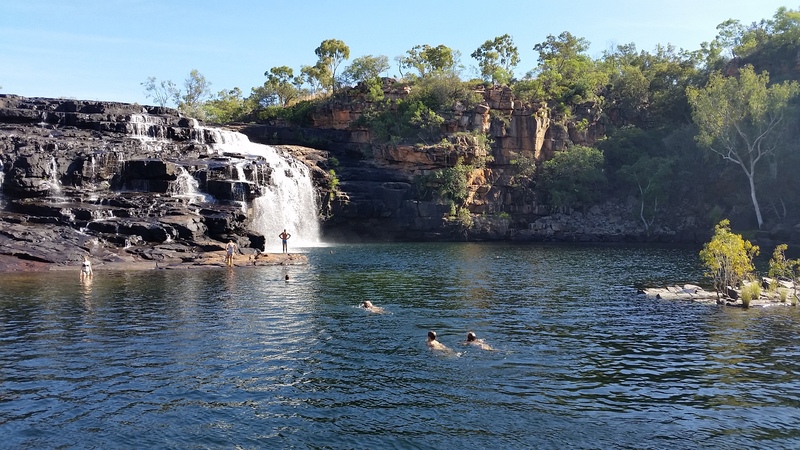 Once at the gorge we spent a lazy morning swimming in the waterfalls, which were by far the best we have seen, even though there was at least 100 people there with us, the falls and swimming area is large enough so that it doesn’t feel that you are all crowded. 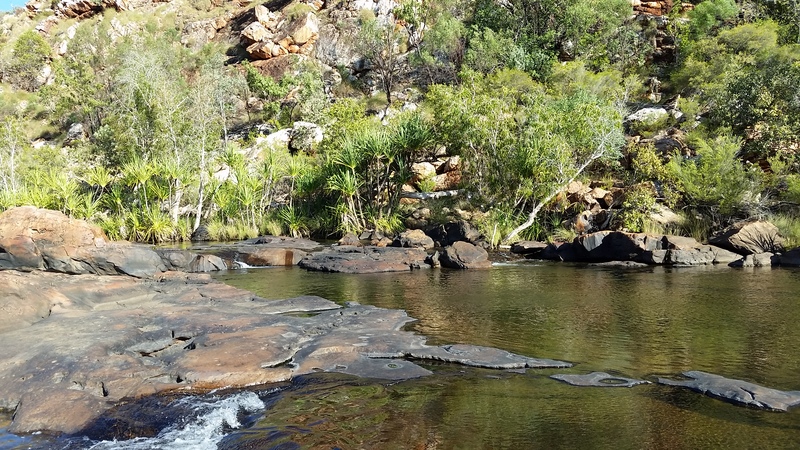 We also spent the next 3 days relaxing and swimming in the river at the campsite, whilst keeping a close eye on a fresh water crocodile who was happily sunning himself on a rock about 50 metres away. 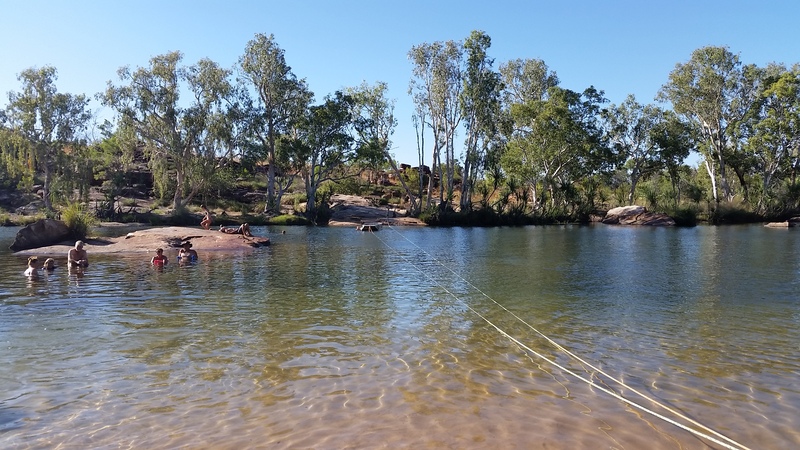 There was a lot of people swimming in the river, so after we calculated our odds based on ours and the girls swimming abilities we felt pretty safe. 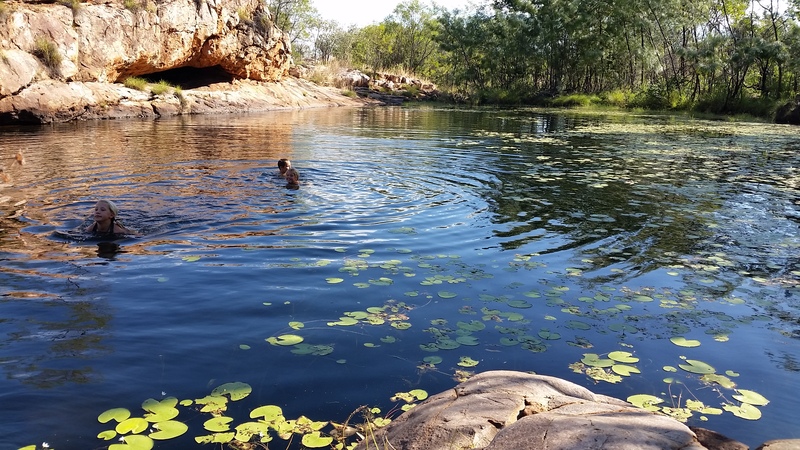 Swimming right at the campsite, just need to keep an eye out for the freshwater crocs. The pulley system that moves the tinny across the river. 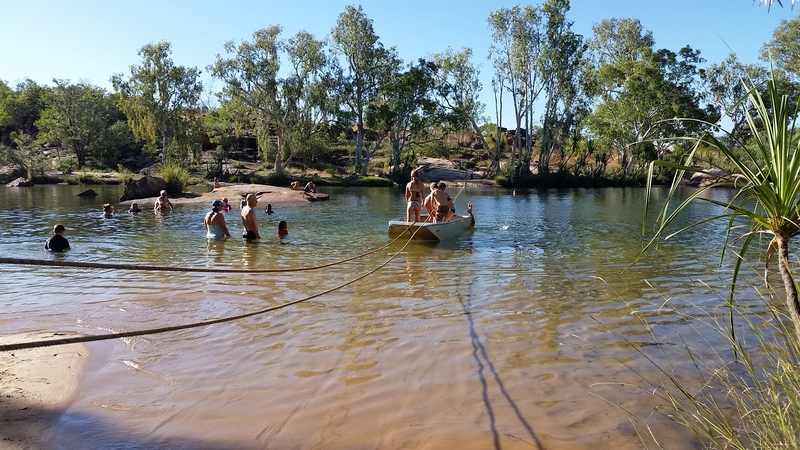 The punt for getting across the river dry, or as a playground is what our kids used it for. 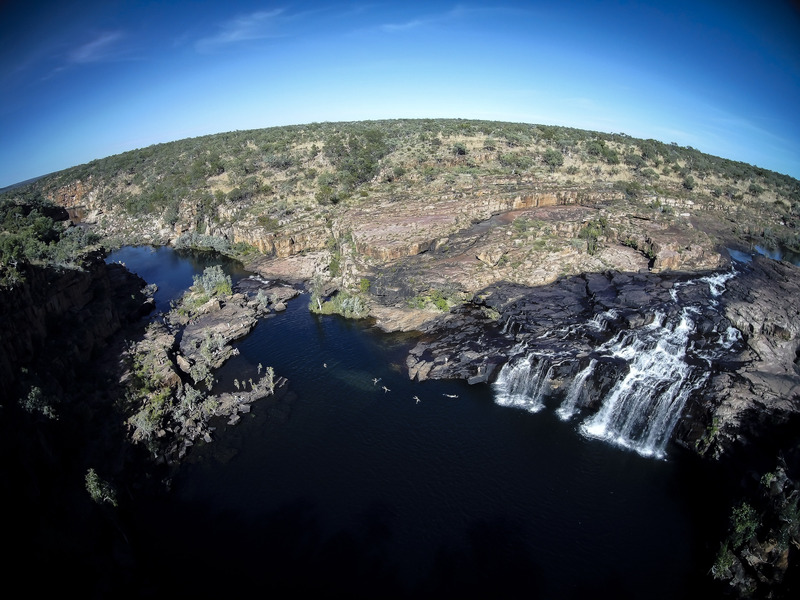 My favourite, Manning Gorge waterfalls. The kids swimming back from the waterfall. 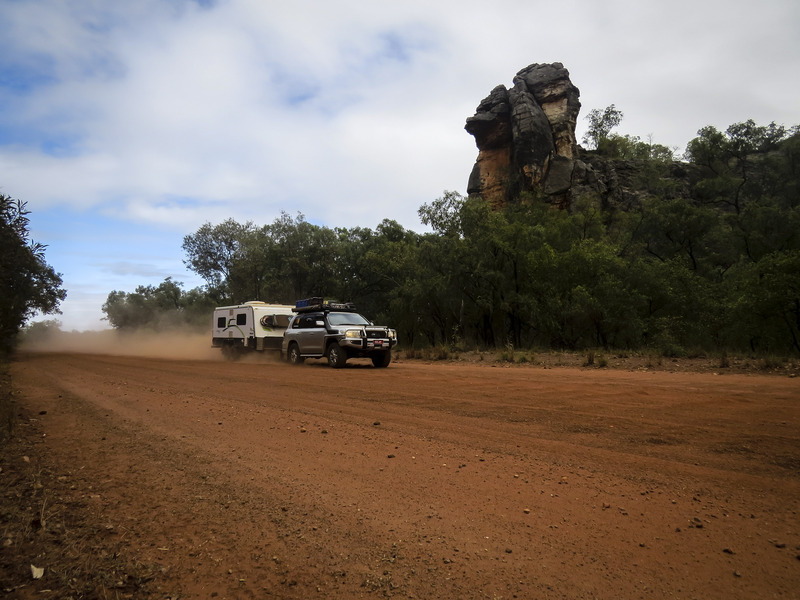 Mt Barnett Roadhouse is the halfway point for the GRR and from here we set off early as we had a big drive onto one of the major attractions for this area, we were very excited about our next adventure and destination on our OZLAP………….. Previous Previous post: Middle Lagoon and Cape Leveque, Western Australia. 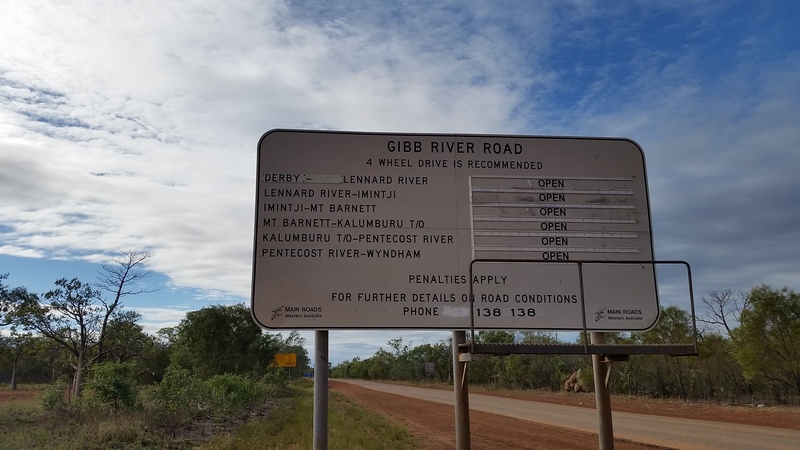 Next Next post: The Gibb River Road, part two. Western Australia. What year did you go? We were there June 2016.